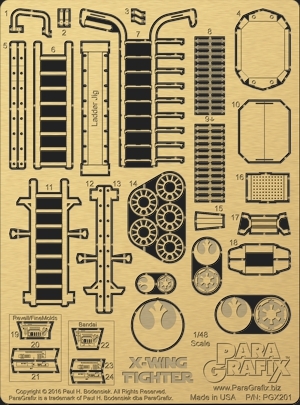 This photoetch set provides easily lit* cockpit controls and engine exhausts to the 1/48 scale kits from Revell, FineMolds, and Bandai. The main controls are based on the interior filming set used in “The Empire Strikes Back”. Also included are five boarding ladders in three different styles – two as used in Star Wars Episode 4 (”A New Hope”) and one from Episode 5 (”The Empire Strikes Back”). Two of the ladders can be made by simply folding the side rails into position, but options are also included for experienced builders to make more accurate ladders with round plastic or brass rod**. BONUS: Imperial and Rebellion medallions in various sizes. ** Plastic or brass rod not included.